It is Bali’s culture, gentle people, breathtaking landscape and lavish beach resorts which attracts visitors to Bali. Its culture is based on its own unique form of Hinduism which forms the core of family and community life. Its influence is also strongly felt in the arts. A mountain range, dotted with volcanoes, stretches across and dominated this magical island of terraced rice fields, full of legends and mystical tales. 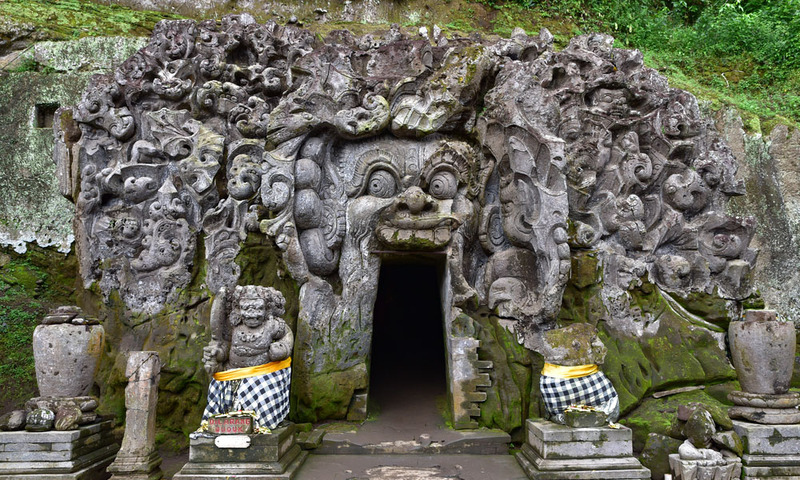 A land of creamations, gamelan music, painters, woodcarvers and stone sculptors, Bali truly is the Island of the Gods. Denpasar, the capital city of Bali province, squeezed between Batubulan and ubung to the north, Sanur to the east and Kuta to the southwest. 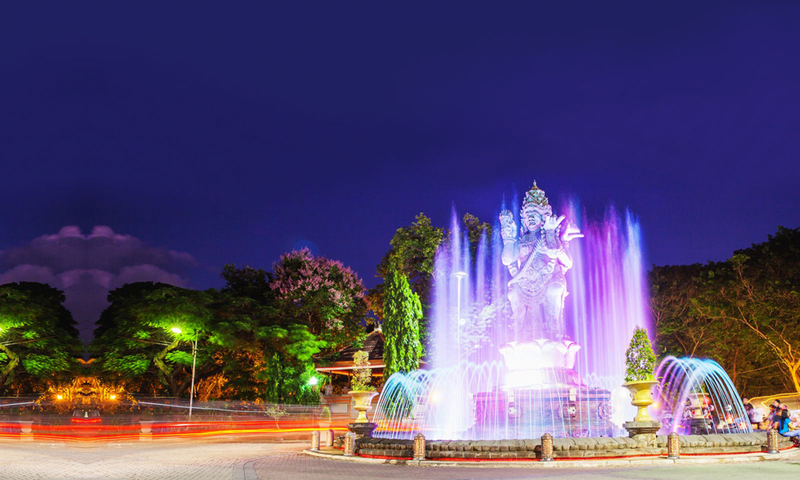 is a bustling city center for administrative, commercial and educational services to Bali and much of eastern Indonesia. The central market is beehive of activity where Balinese and tourists can be found shopping side-by-side. Yet in the center of the mayhem is the Weerdhi Budhaya Art Center, Pura Jagatnatha and the Bali museum. 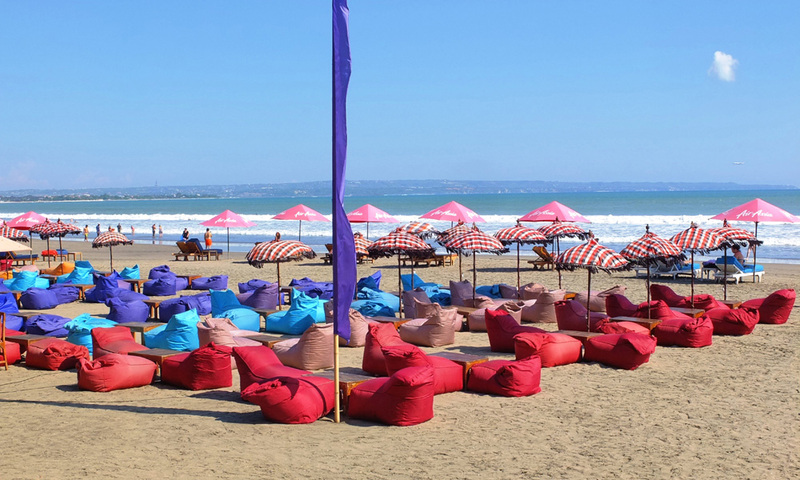 From Denpasar to Bukit Badung Peninsula, Kuta is now a thriving tourist resort particulary favored by the young. With its big rolling waves, Kuta beach is popular with surfers although the currents make it less suitable for swimming. Coat guards are on constant duty during the day. Kuta faces the west, offering beautiful sunsets. Up the road to the north is Legian with its more relaxed atmosphere. Further north still is Seminyak. All three areas abound with souvenir shops, hotels in all price rangers and restaurants catering to tourists. 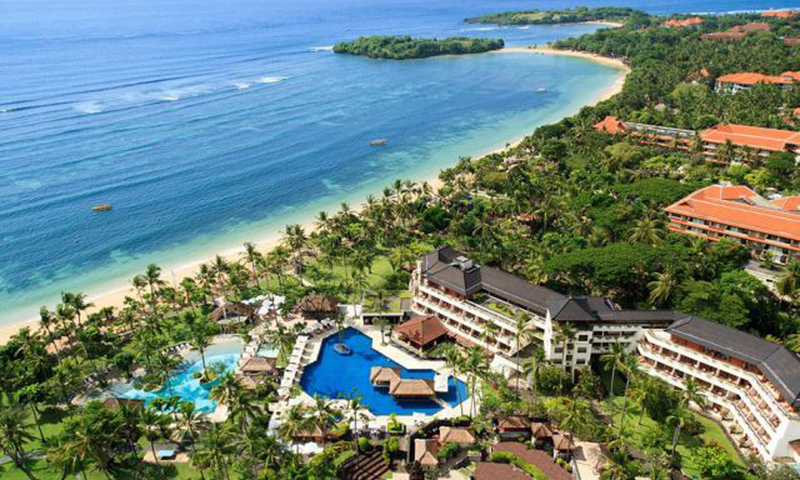 Sanur was developed as Bali’s first beach resort in the 1960’s. It was here that the regulation that no building in Bali should be higher than a coconut palm out of respect to the Gods evolved. As the waves break over a coral feef far from the shore, only small and gentle ones reach the beach in a protected lagoon-like atmosphere. Much quieter and more sheltered than bustling Kuta, Sanur is a place for luxury hotels, serene bungalows and upscale cafes. 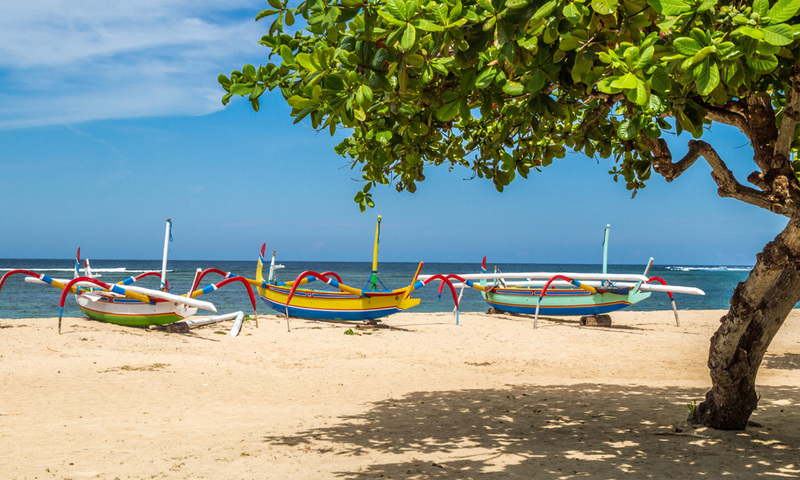 Sanur is also the largest coastal village on Bali. Nusa Dua is part of the Bukit Badung Peninsula in southern Bali. Conceived int he 1970’s as a self contained resort to restrict tourism to one part of the island in order to protect local traditions, it is home to luxury hotels with swimming pools, restaurants, lush gardens and shopping arcades. Lavish buffets and dance performaces make it the perfect location for visitors who wish to experience the best of Bali without straying into the heat and traffic. Known for its clean white beaches and clear waters the surf is gentle along the northern side of the peninsula, more rugged along the south. Developed only fairly recently from dry, barren land. A stretch of Jimbaran beach formerly enjoyed by locals who enjoyed buying fish fresh from the sea and having it grilled on the spot, has now turned into a string of open-air cafes on the sand where delicious seafood can be savored under the light of a full moon. 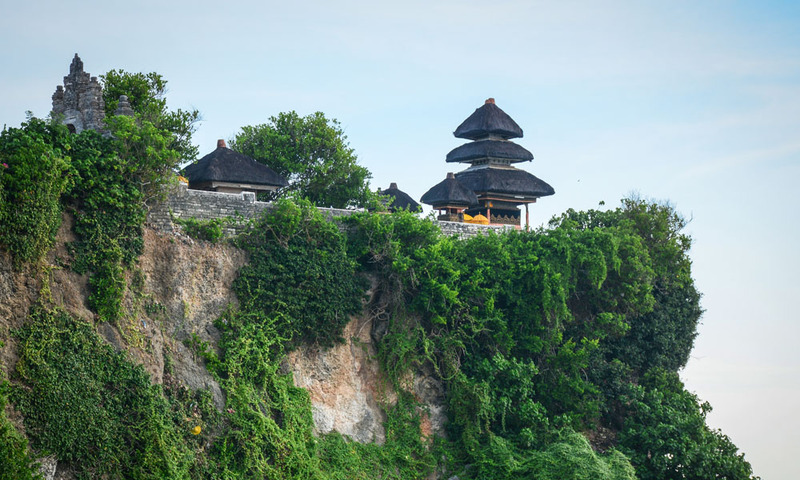 Pura Luhur Uluwatu, one of the six holiest temples in Bali, is 25km south of Jimbaran. The drive to Uluwatu is spectacular with pounding surf 70 meters below limestone cliffs. It is thought that an architect-priest originally built the temple in he 11th century. It was rebuild in the 16th century by Pedanda Wawu Rauh, a priest who believed he attained his moksa (release from earthly desires) here. Renovations took place in the late 19th century in1949 and in the 1980s. Uluwatu is a breathtakingly beautiful place to be at sunset. Tanah lo is an icon of Bali, more photographed than any othermonument on the island. 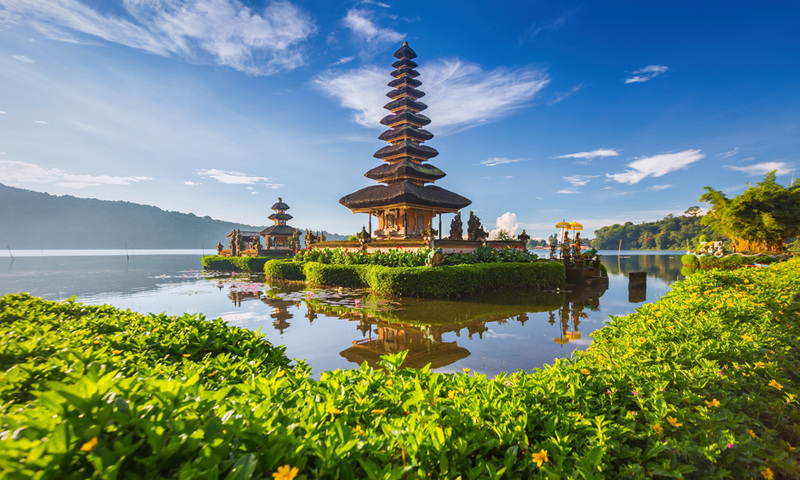 Joined to the shore by a narrow strip of land and is one of the six most holy temples of Bali. 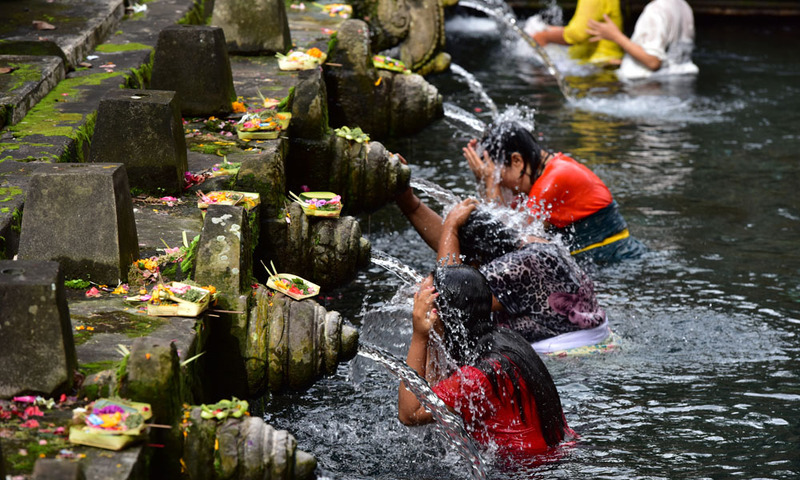 During high tide, devotees breast the waves with offerings for the Gods. Tanah Lot was built by Nirartha Danghyang, one of the last priests arriving in Bali from Java in the 16th century. 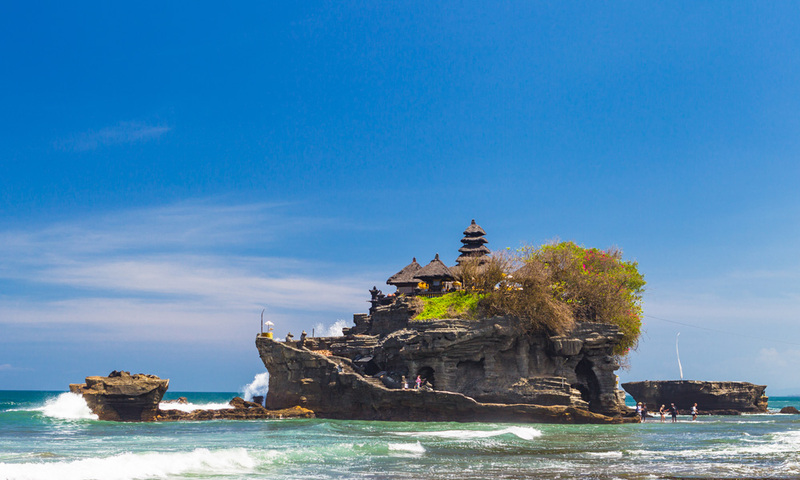 When he reached the spot where Tanah Lot now stands, he created a temple to acknowledge the gifts the gods bestowed upon the island. Te best time to see Tanah Lot is in the late afternoon when the temple is silhouetted against the sky. Balines Hinduism’s unique blend of Hindu and Buddhist elements is most apparent in the sacred relics of Goa Gajah the Elephant Cave. 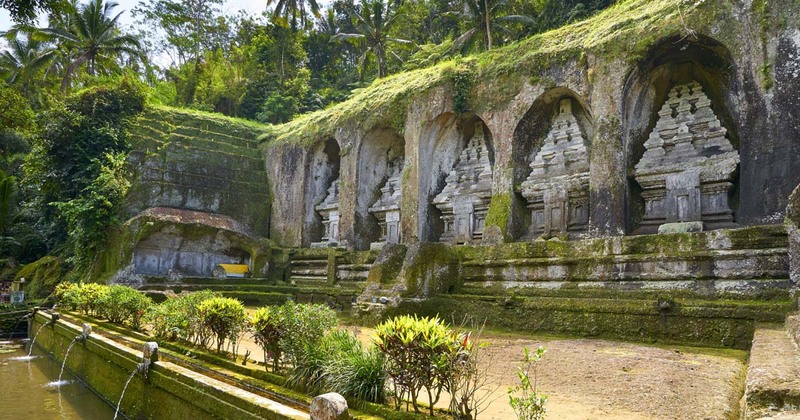 Goa Gajah dates to at least the 11th century. Excavated in the 1950s, the cave entrance is a open-mounthed giant’s head flanked by hands that appear to be pushing away the surrounding rock face. Mas village is best known for its intricate woodcarvings and masks. The historical importance of Mas should not be overlooked. Its inhabitants are primarily Brahman, the priestly caste, tracing their roots to Danghyang Nirartha the founder of the village’s Pura Taman Pule. 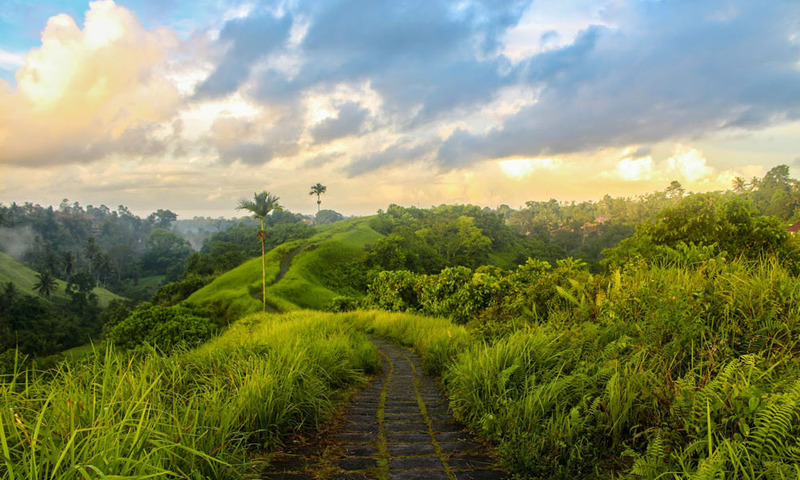 A beautiful locale with a natural inclination to the arts, ubud was home to the first foreigners from Europe in the 1920s artists seeking inspiration within their surroundings. 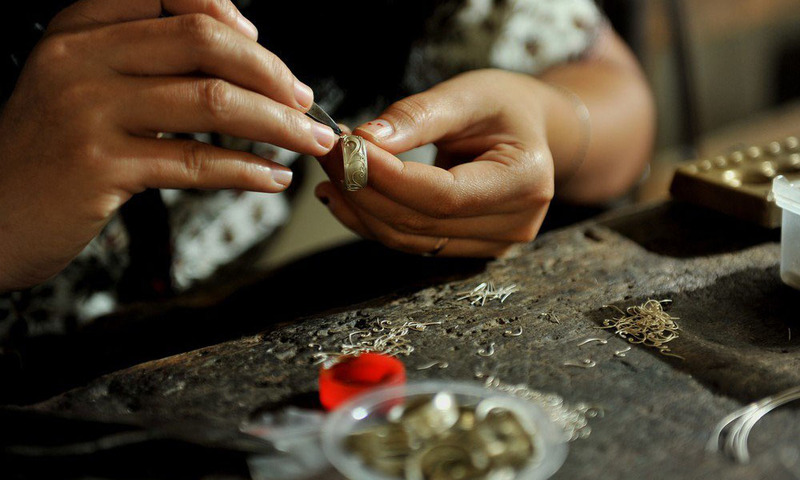 Ubud is a center for artists, surrounded by souvenir outlets, quaint cafes and accommodations. 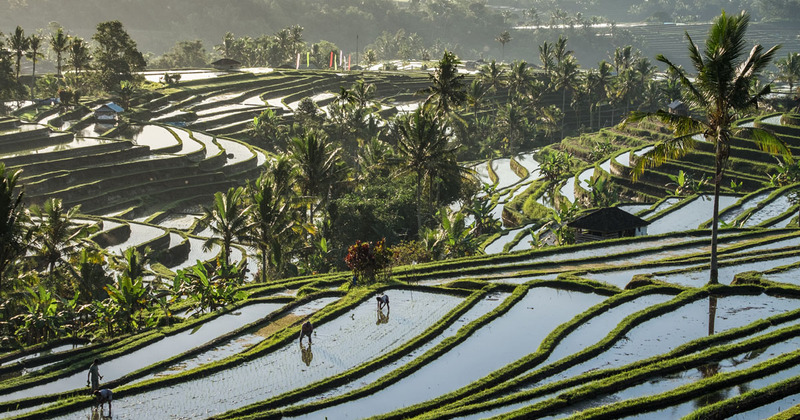 Neighboring villages such as Peliatan and Campuhan have been absorbed into Ubud’s sprawl. 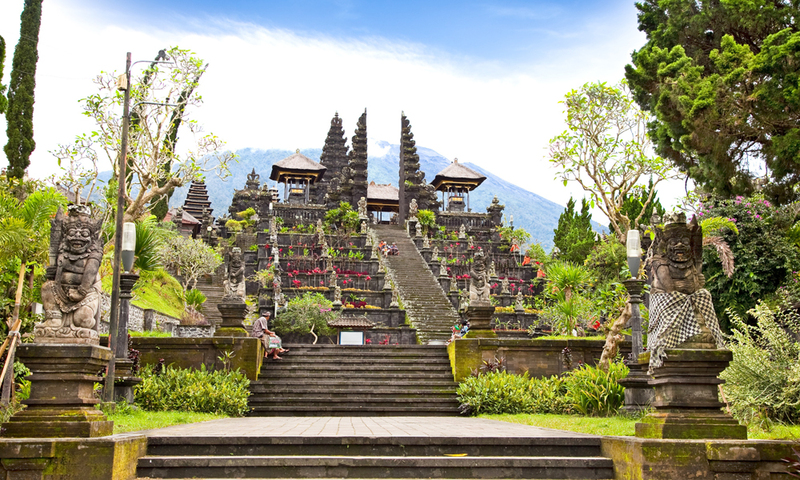 Known as the Mother Temple of Bali, the Besakih sanctuary on the slopes of Mount Agung is the biggest and holiest of all Balinese temples. Over a thousand years old, steep steps ascend through split gates to the main courtyard where the Trinity shirnes wrapped in cloth are decorated with flower offerings. Around the main temples dedicated to the Trinity: Shiva, Brahma and Visnu, are 18 separate sanctuaries belonging to different regencies and caste groups. 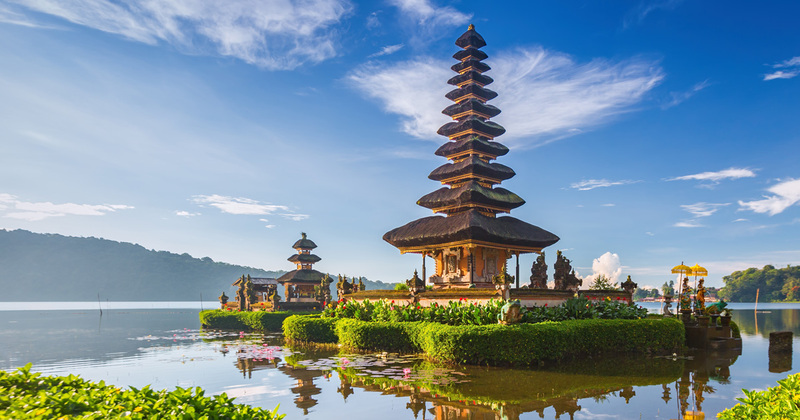 To the Balinese, a visit to the temple is a special pilgrimage. Each has its own anniversary celebration or odalan. The sight of the temple againts the backdrop of the holy mountain is impressive and during festivals colored banner add a touch of gaiety. 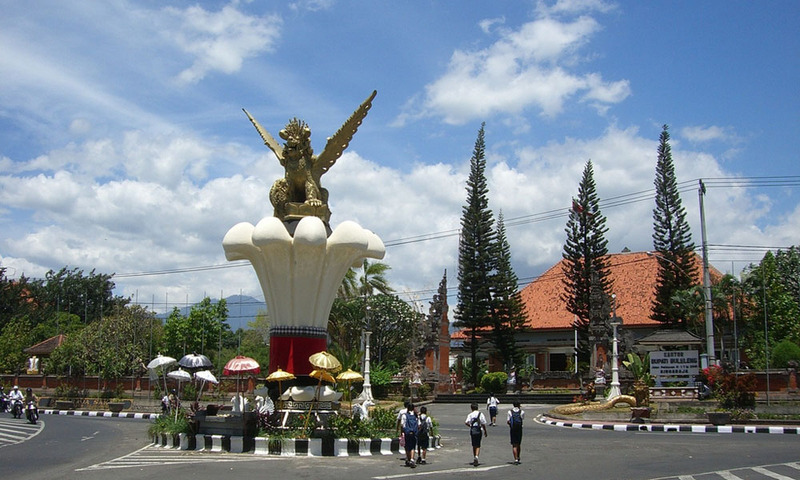 Singaraja was of great importance in the late 19th century when Bali was under Dutch colonial rule. Until 1945 it was the capital of Bali, until that honor was deferred upon Denpasar which with a natural harbor was deemed more appropriate. 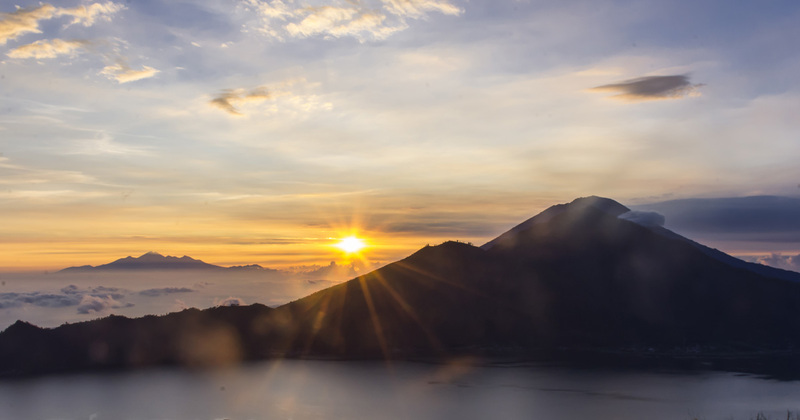 Continuing on the road form Singaraja to Pupuan is some of Bali’s most spectacular scenery. Steeply terraced rice fields plunge down the hillside while towering above is Mount Batukaru, usually covered by clouds after mid-morning. Two islands of f the southeast coast of Bali in the Lombok strait are Nusa Penida and Nusa Lembongan. Not much more than limestone outcroppings dry and barren the local people eke out an existence farming seaweed and fishing. 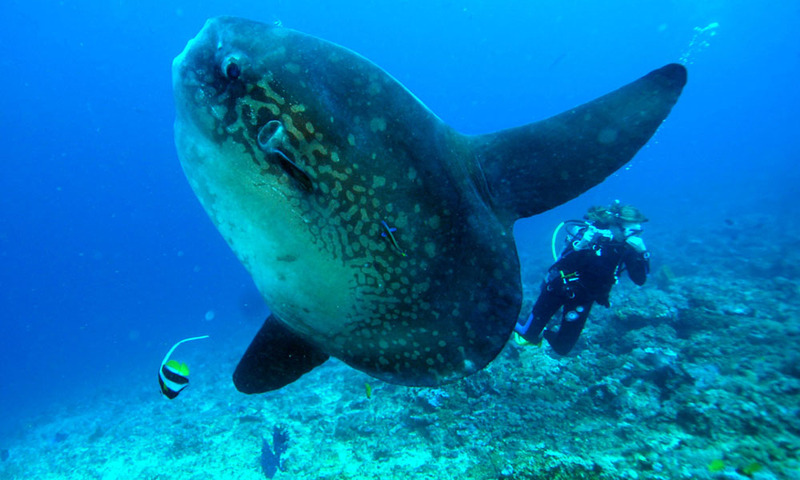 However, surfers, snorkelers, swimmers and divers revel in their shores surrounded by a protective coral reef with massive crashing waves on Lembongan and the calm clear waters of Penida I’m sorry to hear you are out of the rolex replica I ordered but I’m tag heuer replica uk interested in the quartz movement watch. The only breitling replica sale I would be interested would be item 3319 but I can’t afford this watch at the moment so if you cannot accommodate, I would like to be reimbursed for the hublot replica I have already paid for. Don’t worry about the inconveniences. I very well understand this may happen tag heuer replica uk to time and I’m sure we can figure something out. I have chosen a replacement rolex replica uk watch but replica watches is cheaper than the one I had originally ordered. Would I be able to receive the difference back? It should be 6.72 pounds. I’m sure I will definitely buy more panerai replica uk in the near future and I would like to know how I would receive the discount for the compensation. Would it be in a discount code form?